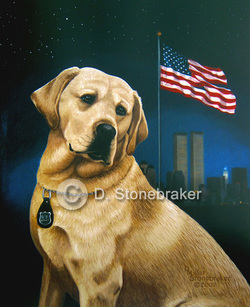 I was honored to have been asked to paint the portrait of Sirius, the yellow Labrador Retriever Bomb Detection Dog who perished in the World Trade Center on 09/11/01 after the terrorist attacks. I actually painted and donated two portraits. The framed original watercolor, "Salute to Sirius" was donated on April 24th , 2002 to his handler, David Lim, and the framed oil painting on canvas was given to the NYNJPAPD in the memorial ceremony for Sirius that was held at Liberty Park, NJ. The original painting is hanging in the police headquarters building. "Salute to Sirius" in both watercolor and oil portrait versions are protected by Registered US Government Copyright to Debra S. Stonebraker. If you want to share this image on your own websites, please link back to me. Any use of the image for monetary gain is strictly prohibited. Thank you to the Port Authority for their blessings on this project, and to all of you who have shown interest in honoring Sirius. K-9's and Officers from all over the United States wait in line to file past the portrait and the urn containing Sirius' ashes. Officer David Lim, Sirius' handler, artist Debbie Stonebraker and her son Cody, a volunteer firefighter from Foley, Missouri. for photographing the memorial event for me. "The Promise"
Also thank you to Sandee Nastasi of Long Island Labrador Retriever Rescue for asking me to create the Sirius portraits for Dave Lim and the NYNJPAPD. And heeds commands to "sit and wait". And in due time it shall be met. And in due time..... it shall be met. For Sirius and Dave and a promise across eternity. Special thanks to Tom Kohler of Blue Horse Gallery for providing the framing on both paintings.